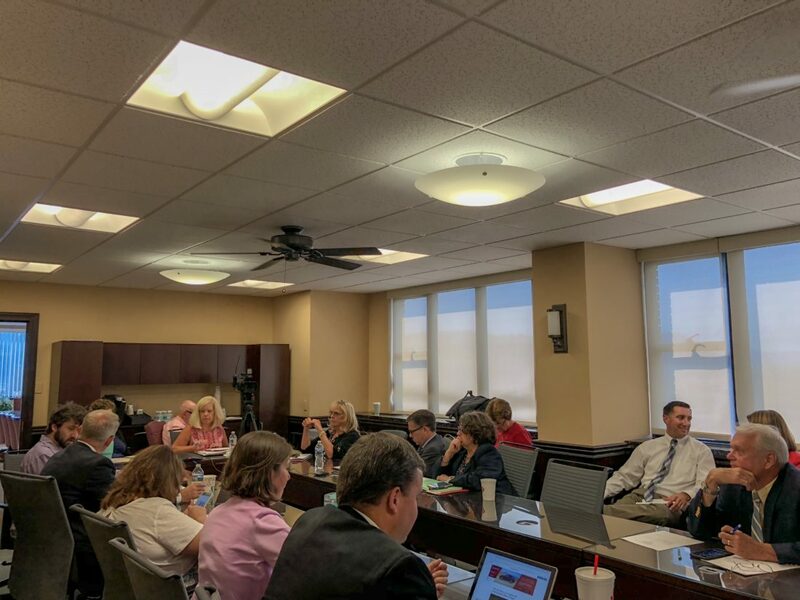 Photo by Steve Adams Staff members await the reconvening in open session of the Higher Education Policy Commission members from an executive session. CHARLESTON — Just as the new Blue Ribbon Commission on Higher Education comes together, the state’s Higher Education Policy Commission suspended its search for a new chancellor and appointed the president of West Virginia University Institute of Technology as interim chancellor, but not without drama. The HEPC held a special meeting Tuesday at its headquarters in Charleston. The commissioners, most of whom called in to the meeting, unanimously voted to suspend the search for a new chancellor for the higher education body. WVU Tech Campus President Carolyn Long was appointed interim chancellor of the HEPC with one vote against and with Bruce Walker, general counsel for the HEPC, immediately resigning in protest and walking out. Long has served as president of WVU Tech since 2011 and oversaw its move from Montgomery to a new campus in Beckley. Before that, Long served on the WVU Board of Governors — including a stint nas chairwoman — from 2008 to 2011. But that is the extent of her higher education experience, having previously served 40 years as a school teacher, principal and county superintendent. Before entering into executive session to discuss the appointment of Long, Commissioner Jenny Allen asked Walker to advise fellow commissioners on the legal qualifications for selecting a chancellor. It’s the last two criteria — being free of institutional bias and retaining no other administrative position in the state’s higher education system — that concern Allen about Long’s appointment. Allen was the lone no vote against Long and a motion by Allen tabling the appointment failed due to lack of a second. Immediately after the vote, Walker resigned on the spot as HEPC general counsel and walked out of the board room. Candace Crouse, deputy counsel, will take over as general counsel. “Bruce out,” he said as he walked out the door. Mike Farrell, chairman of the HEPC and a member of the Blue Ribbon Commission, said Long was recommended by commissioner Drew Payne — another member of the Blue Ribbon Commission and former chairman of the WVU Board of Governors. Farrell said the HEPC made an informed decision on Long. “We had a discussion before the meeting and various members of the commission talked during executive session, and we had a full discussion from a personnel point-of-view,” Farrell said. Despite the advice of counsel, Farrell believes the provisions of state code don’t apply to interim chancellors. The HEPC also voted to enter into a six-month sabbatical with current HEPC Chancellor Paul Hill, who will perform services for the commission as requested and report to Farrell. Hill announced his intentions to retire in March, having served as chancellor since 2012. The HEPC created a 13-member search committee in April, and Hill agreed to continue to serve until his successor was in place. Commissioners agreed to suspend the chancellor search after Gov. Jim Justice created the Blue Ribbon Commission on Four-Year Higher Education July 2. While on sabbatical, Hill will continue to be paid at his current salary. His state compensation is $278,819.93. Long, as interim chancellor, also will be paid the same as Hill. The Blue Ribbon Commission is charged with creating a more efficient higher education system and stopping the erosion in student enrollment and funding. The commission is co-chaired by the presidents of West Virginia University, Marshall University, and Concord University. Concord is specifically singled out in a new report presented to the HEPC Tuesday. Drafted by the National Center for Higher Education Management Systems and paid for in part by the Claude Worthington Benedum Foundation, the catalyst for the report was a letter to the HEPC from Justice in May 2017 asking how to best strengthen and sustain higher education in West Virginia. The report focuses on the regional four-year colleges and universities using publicly available information, data from the HEPC, and in-person interviews with staff from the regional schools and lawmakers. Prescott said the report puts regional colleges and universities into two categories: low-to-medium risk, and medium-to-high risk. Schools at low-to-medium risk includes West Virginia State University, West Liberty University, Fairmont State University, and Shepherd University. Schools at medium-to-high risk include Concord, Bluefield State College and Glenville State University. The report says there needs to remain access to higher education regionally across the state, but there needs to be more collaboration between regional schools, the community and technical colleges, and larger schools, such as WVU and Marshall. The report recommends that many of the roles regional college university governing boards have should be consolidated under the HEPC. It also sees reduction of operating costs as crucial to success of regional schools. Also on Tuesday, West Virginia University Provost Joyce McConnell appointed Gerald Lang interim campus president at WVU Tech because of Long’s selection Tuesday. Lang most recently was campus provost at WVU Tech.